Gun Store Owner Says He's No Longer Selling Mark Kelly A Rifle : The Two-Way Kelly was attempting to make the purchase to show how easy it is to get a semi-automatic rifle. The shop owner said he believes in Kelly's Second Amendment rights, but questioned his motives. 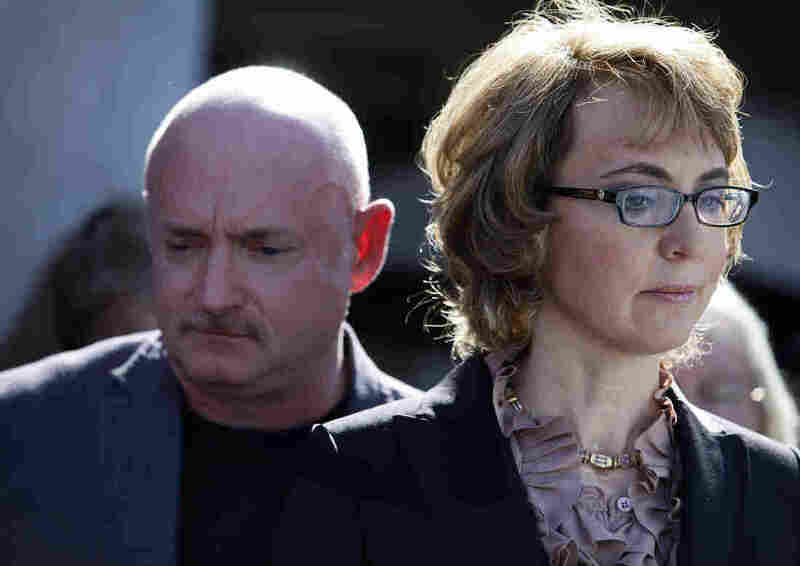 Former U.S. Rep. Gabby Giffords and her husband Mark Kelly attend a news conference on March 6, 2013 in Tucson, Arizona. A gun store owner in Arizona says he is refusing to sell Mark Kelly a semi-automatic rifle. Kelly, along with his wife Gabrielle Giffords, who was shot in the head during a shooting rampage at an event with her constituents, have become advocates for stricter gun controls. Kelly posted on Facebook that he had bought an AR-15. He said he didn't have possession yet, but he was planning on turning it over to Tucson Police once he did. "Scary to think of people buying guns like these without a background check at a gun show or the Internet," Kelly wrote. "We really need to close the gun show and private seller loop hole." On Monday, Douglas MacKinlay, the owner of Diamondback Police Supply Co. in Tucson, said he would give Kelly a full refund. "While I support and respect Mark Kelly's 2nd Amendment rights to purchase, possess, and use firearms in a safe and responsible manner, his recent statements to the media made it clear that his intent in purchasing the Sig Sauer M400 5.56mm rifle from us was for reasons other then for his personal use," MacKinlay said on Facebook. "In light of this fact, I determined that it was in my company's best interest to terminate this transaction prior to his returning to my store to complete the Federal From 4473 and NICS background check required of Mr. Kelly before he could take possession this firearm. "The rifle will instead be raffled off to benefit the Arizona Tactical Officers Association, and the store will donate the cost of the rifle — $1,295 — to the Eddie Eagle GunSafe Program, an NRA effort to teach young children about gun safety. "'The emphasis of the program is on child safety, something that is important to all of us and at the core of the current debate on gun control,' MacKinlay said."